The cover matches all of your education, covers your training, your technical skills, and accomplishments to a particular job for a particular organization. You should only use the most relevant on your covering letter. 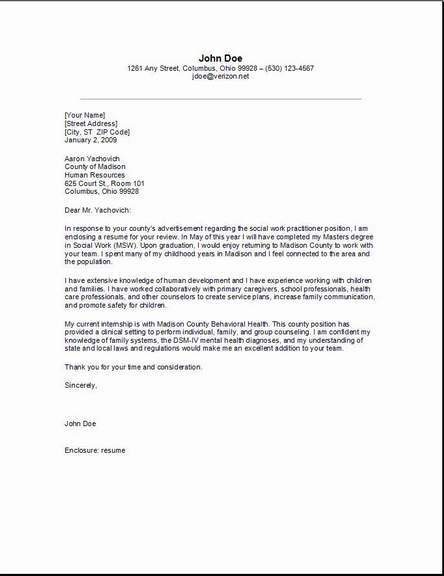 A good letter is a short (3-5 paragraphs usually) story of how you match the job. Like any good story, the opening paragraph should catch the employer's attention and state what position you are applying for and why. The middle should develop your story by providing specific examples of your qualifications. The end will always summarize by requesting an interview and providing your contact information. Try to keep most of your paragraphs brief and relevant. Laser-print your letter on good quality bond paper. Compose your cover letter to the position and company. Show to the employer that your qualifications do match the job duties and their company goals. Proofread. We don't want any errors. Your name will be first. Your street address, city, state, zip. Month, day & year go next. [January 2, 2009]---Space down at least 2 lines. Be sure to confirm the name and gender of the addressee before you start. If you absolutely cannot find the name of the recruiter, personnel director, or director, use their title as a salutation; e.g., Dear Human Resource Director. You want your resume to pop out at them, so start with an opening that grabs their attention immediately. One of my friends who works for your company, (John Doe) recommended that I write you about a position as a production operator trainee. He really loves his job and, from his description of the company management philosophy, I know I would too. Now is the time to quickly let them know the research you have done on the company, to show them you have done your homework. While doing so, state your objective. Refer to the employers add. Also refer how your skills as a production operator, could help their bottom line, as you are very production oriented. One of my friends who works for your company, (John Doe) recommended that I write you about a position as a production operator trainee. He really loves his job and, from his description of company management philosophy, I know I would too. My research of your company, told me we have a lot in common, since my last position was also field related producing plastic polyethylene. I'm confident my experienced skills and my love for the technology field, will be a great match for this open position. This is the place on your cover letter for you to discuss your qualifications and skills, giving examples from past work experience to illustrate your strong points. I welcome this opportunity to discuss in detail with you, this open position. If you would have any questions or you are thinking of scheduling an interview with me, please don't hesitate to contact me by telephone at [phone number] or through my e-mail address at [e-mail address]. I took the liberty and also enclosed an updated resume for you to look over, and I do look forward to speaking with you soon about this open position. End your cover letter with "Sincerely" followed by a comma. Then type your name at least four spaces below that, so you will have plenty of room to hand write your signature. One of my friends who works for your company, (John Doe) recommended that I write you about a position as a production operator trainee. He really loves his job and, from his description of company management philosophy, I know I would too. While doing research of your company, I found we have a lot in common, since my previous position was also field related manufacturing plastic polyethylene. I am also confident that my qualifications and my passion for technology will be a perfect match for this position. I would like the opportunity to discuss this open position with you. If you would have any questions at all or you might want to schedule a personal interview with me, please don't hesitate to contact me by telephone at [phone number] or by my e-mail at [e-mail address]. You will find my enclosed resume for your review, and I look forward to hearing from you. In this very first paragraph explain why you are contacting the person, also mention your connection with that person or someone who knows that person. Describe where you heard about the current job. You will also briefly state who you are. Next, wow them with your very sincere, research you collected on their company. The statement you are making to them is that you are knowledgeable about the company business, and you are a worthy applicant, once they see you know your business and research, they will read more. In this second paragraph communicate more about yourself. Explain with detailed examples, that you are the best and most suitable candidate for this position. Then end this paragraph with detailed qualifications you have that make you exactly what they are looking for in an employee. This ending paragraph will be you thanking the person reading this letter, for their time. Also include, you will be looking forward in the future, hearing from them or a representative of their company, with their reply. A good idea to end the letter is to give this person reading your cover letter, an exact time that you will be contacting them, for a follow up conversation. 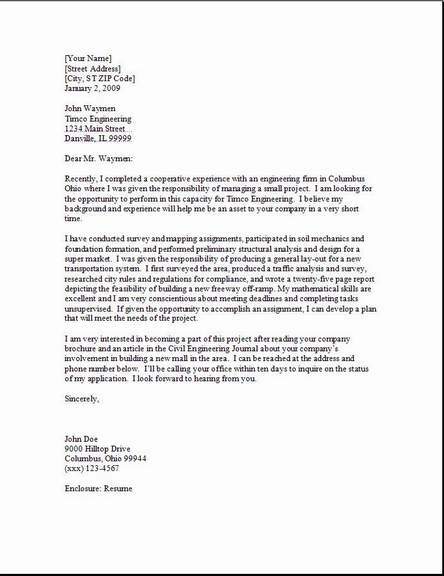 Here are some sample cover letters of what we just went through above. 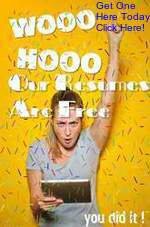 FREE--Resume Reference Page Get it here! How can I write my own cover? What choices or options do you have when you sit down and say to yourself, how can I write this cover letter? If you would not like to do it on your own, you can always buy software that will make it a lot easier for you, or pay a friend to write it for you. It is more gratifying to write it on your own merits if possible, you will feel better about it, and also the self knowledge that you put into it will come out automatically in the job interview. But how do I start this project if you have never written a cover before. The answer for you my friend, is by first, obtaining an example cover letter. Where do I look you ask yourself to find an example or many samples? You could go to the library and pick up a good cover letter book that has many samples and examples in it. Or I would suggest, finding a good example from the Internet. The most logical way to do this is to search for the words "example cover letter" also add whatever job title your profession is. Examples of this would be (a perfect cover letter as a bank teller). Or you could try (production operator cover letter). You don't want to search in general terms like "example cover letter", or you will find 100,000,000 million options for unrelated jobs. So we want to be very specific in our correct search terms. Well, you will find what you are looking for a lot faster anyway. Don’t get me wrong, this broad search will still help you, although it will be better for you in the long run if you find as many samples that are already prepared for the job position you are seeking. Looking at the many examples you found off the internet, you will have a good idea of what your final format will look like when you are done editing it with your own information. Please use it only as designed, as a guide. What are samples and examples you ask? 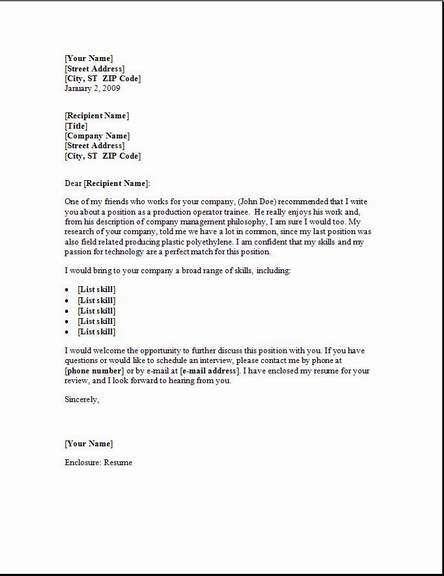 It is in reality a template that contains a preformed format that someone has transformed into a finished occupational cover letter. This formatted template is predesigned. When looking at the content in the examples, edit the template and replace everything with your own information. And since the examples show in great detail a lot of information about specific job titles , you have a great idea of what you need to do to write your own work history information into the document and make it your own. Remember to use as a guide only the example cover letter you found off the internet. Edit and use all of your own information. Change everything to suit your own situation. The examples of formats out there are many. You really don’t have to work to hard at it to complete your own cover for your resume. About three paragraphs are all you need. Just say it differently so that it brings out the you. Follow the examples and you will have created something you can be proud of when you are finished. It’s a great feeling doing it yourself. Now go to my resume templates A-I, download, and (save) it to your desktop. Backspace through the provided information, and edit with your own. You can go to the next page Job Interview from here. Now go Back to Free Resume Templates home page to find your new resume.